Various material developed by the participants in the training displayed in the training venue. Teachers in the training were divided in four groups and each teacher in each group was assigned with a responsibility. They placed their names on the Job Chart as per their responsibility mentioned on it. 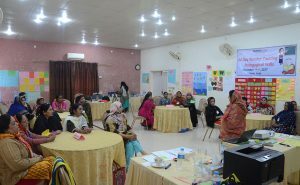 Twenty female teachers from 14 primary schools of Thatta attended the informative training. 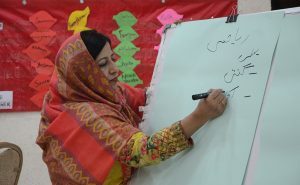 Nazakat from Community World Service Asia, facilitator of the training, delivering a session on Teaching of Mathematics. 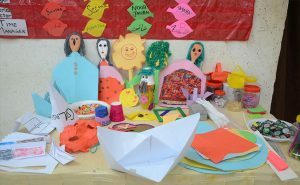 In a group activity, one group of teachers made different art work during the Low cost no cost material development session. 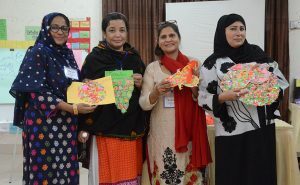 A group of teachers displaying their paper mache art work. A group of teachers made different puppets and plants through the use of wooden spoons in the Low cost no cost material development session. A display corner of low cost material developed by teachers. 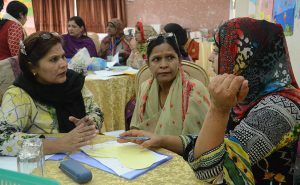 Participants were actively engaged in group activities which enhanced teamwork and debating skills. Fehmida Khuskh, Primary School Teacher, GGPS Mohammad Hussain Khushk Makli, Thatta, writing group role during the Morning Meeting session. 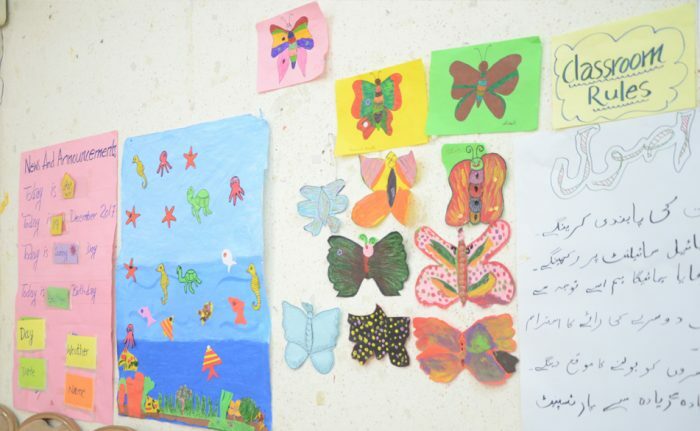 The participants were engaged in various kinds of art work which elevated their creativity skills. 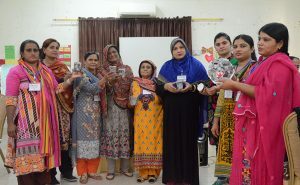 A four-day teachers training on pedagogical skills was conducted under the Girls Education Project supported by Community World Service Asia and Act for Peace in Sindh province, Pakistan. 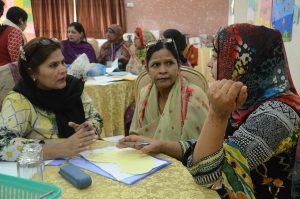 The training was held for primary government schools’ teachers in the Thatta district in the late weeks of December and was attended by twenty teachers (women) from fourteen schools. The workshop aimed at teaching classroom management skills to teachers to enable them to create child-friendly and conducive learning environments. Focusing on child psychology, child rights and child protection, the training included various sessions on classroom management, language, mathematics, introducing the morning meeting, developing low cost and no cost teaching materials, and awareness on gender, health and hygiene. 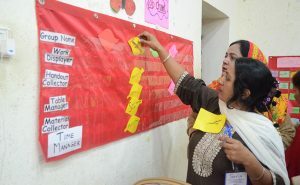 These interactive and working sessions helped the teachers to convert their traditional classroom into child-centered ones, where students are at the centre of the learning process. The sessions on child psychology, rights and protection emphasized on treating all students with equal respect and love irrespective of their gender, age, religion and other ethnic stereotypes. 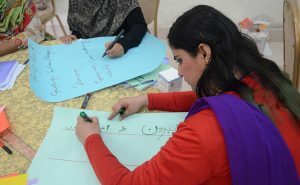 The teachers learnt how to deal with student issues via understanding their needs through basic psychological analysis. 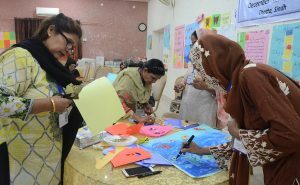 Teachers also learnt to develop low cost teaching aids from recycled materials to make classes fun, easy and memorable for their students. Health and hygiene sessions, especially on adolescent health care, aimed to build capacities of teachers on guiding their students towards instilling good hygiene habits and environmental preservation practices from an early age.